Information was released under the label "RapidFire"
6.54 points at 13 votes (rank 497). 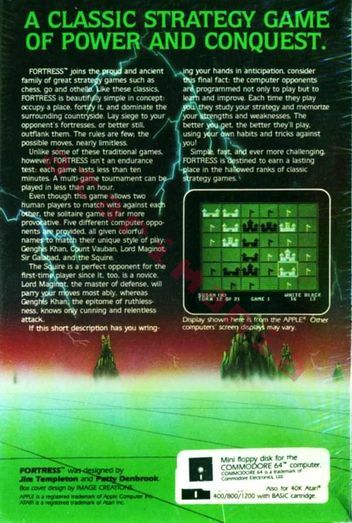 Fortress is a strategy game for two players similar to "Go ", which is played on a board the size of 6x6 fields. The aim of the game is, to control as many fields as possible. For this fortresses are build on the fields, which can be upgraded to three times the strength by extension. One move is building or extending a castle. The castle has a ban effect, which works only for directly neighbouring fields, not to diagonally neighboured ones. The strength of the effect corresponds to the strength of the castle. A field is then controlled by a player if his castle is on the field or if it is inside the ban effect of his castle. Is this field also neighboured by a hostile castle, then the ban effects of both sides are set off. The field is then counted to the player whose ban effect is bigger, if it is the same, the field is neutralised. Fortresses can be besieged by the enemy and be destroyed. A castle without an own neighbour is then besieged, if the enemy causes a ban effect with the strength of the ban effect of the castle. If there are own neighbours, the ban effect of the own neighbouring castles is added to the besieged castle. A castle is destroyed, when the ban effect of the enemy is one stage higher than necessary to besiege the castle. The player, who has occupied the most fields (castles + flags) after the number of preset moves have been done, wins. The castles are placed inside the fields, the control of a field is displayed by flags, the siege by a closed castle gate. When a castle falls or at the end of the game, a fanfare is played. One should make a copy of the original disk (or at least of the files of the computer player), as after an update of the computer strategy, you won’t be able to reset to the basic state!! The controls in the menu are done by pressing the key which corresponds to the menu point. (The "HOME"-key corresponds to the "Pos1"-key when using an emulator). The controls in the game are done by joystick. The white cursor rectangle is moved by the joystick, a castle is build or upgraded by pressing the fire button. The computer has several strategies at his disposal, which are named after historical commanders. You can also let the strategies play against each other. For each player (no matter if computer player (C) or human player (H)) you can create a history, in which the results of the tournaments can be saved. The computer learns during a tournament (consisting of up to 15 games). The improved strategies can also be saved on disk. The difficulty grade of a game can be raised, by setting, that the siege status is not displayed. By changing the number of moves per game, some strategies become ideal. Count Vauban: The average player (default when starting the game). Knows about defence as well as attacks. The Squire: More suitable for beginners. Is easy to beat at the beginning, but is a fast learner. Sir Galahad: Knows already many tricks at the beginning. Likes to occupy fields at the border. Genghis Khan: Plays very aggressively and tries his luck in attacks. But this can also be his doom. Lord Maginot: The master of defence. Whenever you think you have defeated him, he pulls another trick out of his sleeve. There are many strategies, e.g. you can try at the start to place the castle in a grid pattern and then fill the gaps. In the final moves it is important to occupy as many fields as possible, i.e. place a castle on an unoccupied field. You can also learn a lot, if you let the computer play against himself with different strategies. Sledgie: "Very nice strategy game on the C64. Strangely, I have only detected it this year. It is fun against human players or against the computer." 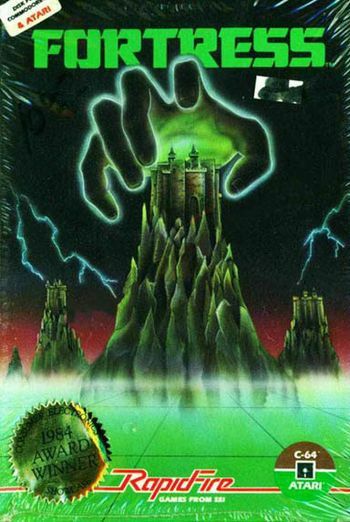 H.T.W: "This was probably one of my first computer games, which was equipped with an adaptive „AI“. It is also interesting, that after a longer time of playing and more often update of the strategy of the computer player, it acquires certain basic moves of the playing technnique of the opponent without losing the own behaviour pattern. There was also the "$1000 SSI Fortress Tournament", where you could send in the strategy files of the own pimped computer player , which then played against one another. But, unfortunately, I never found out who had won this tournament. Another thing, one would not believe it, but the main part of the program was written in Basic. Anyway, for me a very good game.". There is no highscore possible in this game.